Layers have many uses in Adobe Illustrator. In this lesson, you will find out how to use layers to lock and temporarily hide artwork that you don’t want to inadvertently select while you work on other things. 1 Open the Layers panel by clicking the Layers button ( ) in the dock on the right side of the workspace. Notice that when you start to work in Illustrator, you begin with a layer named Layer 1. All the artwork that you have created throughout this lesson is added as a sub-layer to this layer. You will now lock a layer and create a new layer onto which you can put additional artwork. 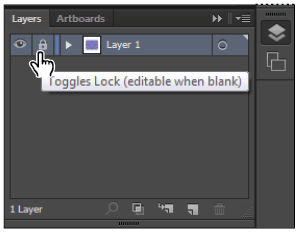 2 Click on the Toggles lock (a small empty box) to the left of Layer 1 in the Layers panel. A Padlock icon ( ) appears, indicating that this layer is locked. You cannot select or change any items on this layer. The Toggles lock area of the Layers panel. Earlier in this lesson, you selected and locked the rectangle using the Object > Lock menu item. That method works well for individual items, especially if you don’t typically work with layers. Locking a layer is different, as it locks all items on the layer at once. 3 To unlock the layer, click on the Padlock icon. The layer unlocks. 4 Relock Layer 1 by clicking on the Toggles lock square again. You will now create a new blank layer onto which you can paste artwork. 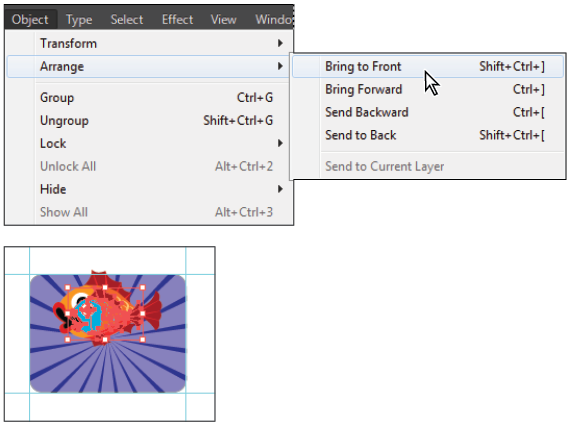 1 Alt+click (Windows) or Option+click (Mac OS) the Create New Layer button ( ) at the bottom of the Layers panel. The Layer Options dialog box appears. By holding down the Alt/Option key, you can name the layer before its creation. 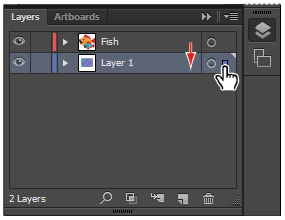 2 Type Fish into the File name text field and click OK. A new empty layer appears on top of the original (Layer 1) displayed in the Layers panel. You are now ready to copy and paste artwork from another Illustrator file into this one. Name the new layer. The layer in the Layers panel. You will now open another document and cut and paste artwork from one Illustrator file to another. 1 Choose File > Open. In the Open dialog box, navigate to the ai01lessons folder and double-click on the file named ai0304.ai. Artwork of two fish appears. 2 Use the Selection tool ( ) to click once on the larger of the two fish, then Shift+click on the second fish to add it to the selection. 3 Choose Edit > Cut, or press Ctrl+X (Windows) or Command+X (Mac OS), to cut the fish. 4 Return to the work file by choosing Window > ai0303_work.ai. 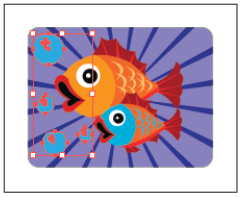 Choose Edit > Paste, or press Ctrl+V (Windows) or Command+V (Mac OS), to paste the fish onto the artboard. The fish are pasted onto the Fish layer, which is the active layer. 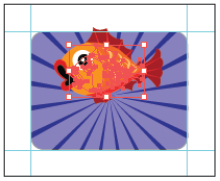 5 Press Shift+Ctrl+A (Windows) or Shift+Command+A (Mac OS), or click on a blank area of the artboard, to deselect the fish. 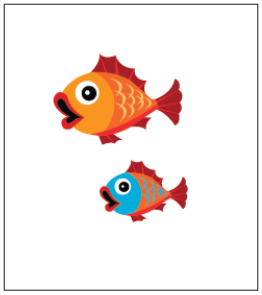 6 Activate the Selection tool; click on the smaller of the two fish and drag it to a spot on top of the larger fish. Notice that the smaller fish disappears behind the larger fish. The order in which artwork appears is based on the order in which artwork is created. Newer artwork is placed higher in the object stacking order, which can be changed using the Arrange feature. larger fish in the stacking order. 7 With the smaller fish still selected, choose Object > Arrange > Bring to Front. the front, and then view the result. 8 Select the smaller fish and reposition it so that it slightly overlaps the bottom of the larger fish. 9 Choose File > Save. Keep this file open for the next part of this lesson, but close ai0304.ai. When asked if you’d like to save the changes made to the document, choose No (Windows) or Don’t Save (Mac OS). You will now create a bubble, and then clone it several times to finish the illustration. 1 Click and hold down on the last-used shape tool (the Polygon tool) in the Tools panel and select the hidden Ellipse tool ( ). 2 Click once on the artboard to display the Ellipse dialog box. 3 Type .5 into the Width and Height text fields. Click OK. A small circle is created. 4 Click the Fill color swatch in the Control panel and choose the color CMYK Cyan from the drop-down swatches menu. Change the fill color to CMYK Cyan. The result. 5 If the Stroke is not set to none ( ), choose the Stroke box in the Control panel and choose None from the drop-down swatches menu. Now you will create a smaller circle to use as a reflection in the circle you already created. 6 With the Ellipse tool still active, click once on the artboard. 7 In the resulting Ellipse dialog box, type .1 into the Width and Height text fields and click OK. Create a smaller circle. The result. 8 Use the Fill box in the Control panel to select White for the small circle’s fill. 9 Activate the Selection tool ( ), then click and drag the smaller circle on top of the larger cyan (blue) circle. Position it anywhere you want on the circle, as long as it looks like a light reflection on the bubble. 10 Shift+click the larger and smaller circles to select them both. Choose Object > Group, or press Ctrl+G (Windows) or Command+G (Mac OS), to group the circles. 11 Choose File > Save to save your work. You will now clone, or duplicate, the bubble several times. 1 Make sure the bubble group is selected. 2 Hover your cursor over the bubble and hold down the Alt (Windows) or Option (Mac OS) key. Note that the icon becomes a double cursor ( ). 3 While holding down on the Alt/Option key, click and drag to the right. Notice that as you drag, the original group of circles remains intact and you create a second group. Release the mouse when you are off to the right and the cloned bubble no longer touches the original. (Mac OS) key, then click and drag. 4 Press Ctrl+D (Windows) or Command+D (Mac OS) to repeat the duplication. Illustrator remembers the distance and angle of the last movement. You can also perform this function by selecting Object > Transform > Transform Again. 5 Press Ctrl+D (Windows) or Command+D (Mac OS) once more to create a total of four circle groups. If you hold down the Shift key while cloning, you can constrain the cloned objects to move on a straight path, or a 45- or 90-degree angle. Clone the circle group three times. 6 Choose File > Save to save your work. Keep the file open for the next part of the lesson. You will now use the Transform Again keyboard shortcut to transform the bubbles so they are varying sizes. 1 Select the second bubble. You will leave the original bubble at its current size. 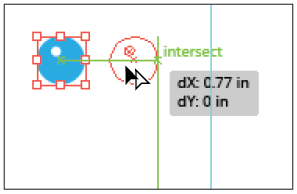 2 Hold down the Shift key (to constrain the proportions as you resize), and click and drag a corner anchor point to resize the bubble only slightly. An exact amount is not important for this. Once you resize, do not perform any other actions, such as repositioning. The resizing has to be the last action that you performed for the Transform Again feature to work properly. 3 Select the third bubble group and press Ctrl+D (Windows) or Command+D (Mac OS). This applies the same transformation to the third bubble. With the same bubble still selected, press Ctrl+D (Windows) or Command+D (Mac OS) again and the resize transformation is applied, making it even smaller. 4 Select the last (fourth) bubble and press Ctrl+D (Windows) or Command+D (Mac OS) three times, making this the smallest bubble. Remember that the Transform Again feature (Ctrl+D [Windows] or Command+D [Mac OS]) repeats the most recent transformation, including positioning, that you performed. If you resize and then move an object, the repositioning, not the resizing, is repeated. If this occurs, press Ctrl+Z (Windows) or Command+Z (Mac OS) until you return to the point where all the bubbles are the same size. Then restart at step 1. 5 Using the Selection tool ( ), click and drag each bubble down and position them around the fish, on top of the rectangle. No exact position is necessary. You will now move the bubbles onto Layer 1, under the rays of light. 1 Select one of the bubble groups, then Shift+click the remaining three so that all four bubble groups are selected. 2 If the Layers panel is not visible, open it by clicking the Layers button ( ) in the dock or by choosing Windows > Layers. 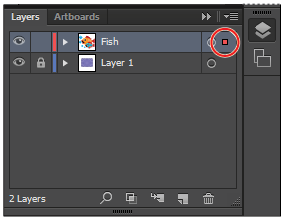 A colored square appears to the right of the Fish layer in the Layers panel. This colored square is called the selection indicator. If Illustrator’s settings are at their defaults, the indicator is red, matching the layer selection color. 3 Click the Padlock icon ( ) to the left of Layer 1 to unlock the layer. 4 Click and drag the selection indicator from the Fish layer down to Layer 1. The bubbles are now on Layer 1 instead of on the Fish layer. 5 Click on any one of the triangles that you used to create the rays of light. Because they were grouped earlier, selecting one selects the entire group. 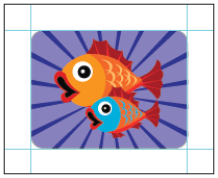 6 Choose Object > Arrange > Bring to Front; the triangles are now on top of the bubbles, but not on top of the fish. This is because the Fish layer is higher in the stacking order than any objects on Layer 1. 7 Choose File > Save, then File > Close.